Twist, aka Marker Twist, is a cute white-and-red 2-year-old female, born April 28, 2002. Her sire is Trojan Cruze and her dam is MH Gummy Bear, who she resembles very closely. 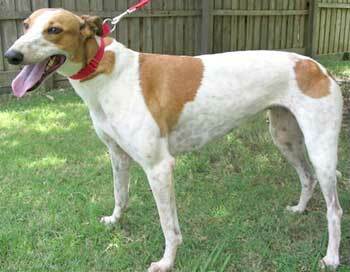 Twist did not make it past her schooling days, and is ready to find her forever home. Twist is a playful gal with lots of spirit! 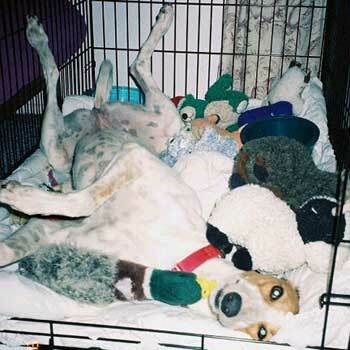 Twist is not cat tolerant, but gets along well with other dogs. Twist is one big, happy girl! She loves everything and everybody. Her favorite things are: stuffies, food, playing with other dogs, hugging and kissing me, and getting belly scratches and ear rubs. She has learned the proper use of a dog door, the proper place to pee and poop, and just how much fun it is to simply be alive and loved. Twist loves to walk right by my side, but will drop and do a classic "Greyhound Roach" wherever and whenever the mood strikes. (She's very good at reaching out to me for a rub as I walk by, and who could resist that speckled belly?) She is a beautiful, affectionate girl with tons of love to share. 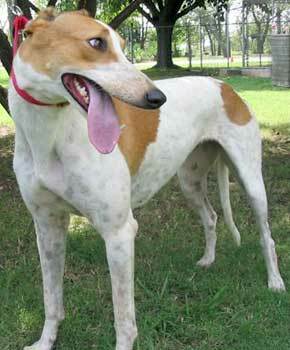 Twist is waiting to be discovered by her future forever family, and will you a lifetime of unconditional joy and love.